If there is one thing I'm rarely able to resist, it's the Apple Cider Donuts at the Union Square Farmer's Market. Sold by the apple farmers alongside steaming vats of hot apple and pear cider, they're one of my favorite autumn treats. As much as I love those donuts, the Union Square market is a bit of a hike from my uptown apartment, so it's rare that I actually make it down there. But I recently learned that there actually is a farmer's market held every Tuesday just about half a mile from where I live! Excited to potentially have a market (and these donuts) within walking distance, I packed up Hudson and few grocery bags and walked up there earlier this week. I rushed past the stalls piled with hearty greens and dusty root vegetables in search of the apple vendors and excitedly pushed through once I saw them. The dog and I walked home, enjoying the crisp fall air and crunchy leaves, but with an unsatisfied craving for donuts. By the time we got home, I'd already decided to make my own. Real apple cider donuts are fried--something which I do actually plan to do in the future--but for now I wanted something a little quicker. 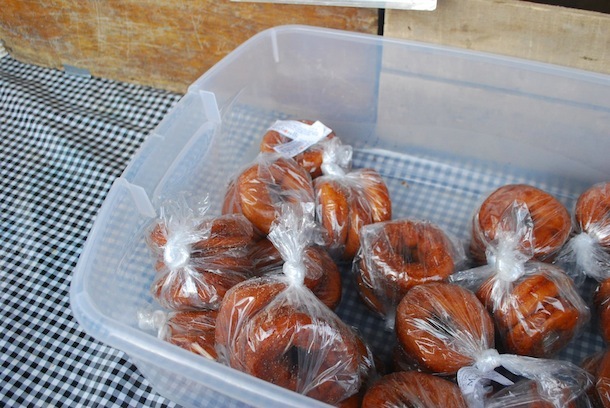 Hence these Baked Apple Cider Donuts. 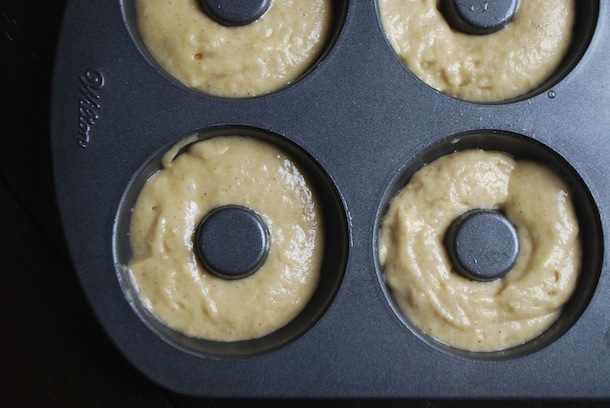 It's a quick batter that is then baked in donut pans (or use muffin tins if you don't have donut pans), and then dipped in butter, cinnamon, and sugar. I made sure that they got a great apple cider flavor by doubling the usual amount and then reducing it down to a more concentrated cider. If like me, you've got a craving, these are definitely a great way to satisfy it (a little bit). Makes 12 Donuts. Adapted slightly from Eat Live Run. Preheat oven to 325 degrees. Grease two doughnut pans (6 doughnut wells each). Place apple cider in a small saucepan over high heat, and bring to a boil. Reduce heat to a gentle simmer and let cook 5 -7 minutes, or until cider is reduced by half. Remove from heat and let cool completely (can be done in advance and chilled). In a large bowl, combine the flour, sugar, baking powder, salt, and ground cinnamon and set aside. In the base of a mixer or by hand, beat the eggs, buttermilk, vanilla, and cider reduction. Pour into the flour mixture and mix gently just until completely combined with no dry bits. Divide into the doughnut pans, filling each about 3/4 of the way. (I use a piping bag for this, but a spoon and wet fingertip works well, too! ), and bake in the preheated oven about 20-25 minutes, or until puffed up and golden. Let cool in pan about 5 minutes before removing to a cooling rack. Melt the butter and place in a shallow bowl. Whisk sugar and cinnamon and place in another shallow bowl. 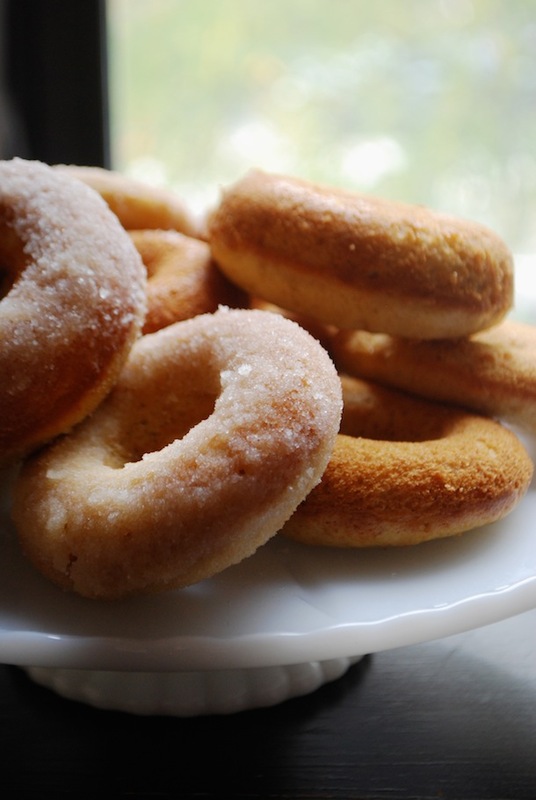 Dip the donuts into the butter then into the sugar until fully coated. Repeat until all donuts are coated. Let set for a few minutes, and then serve.